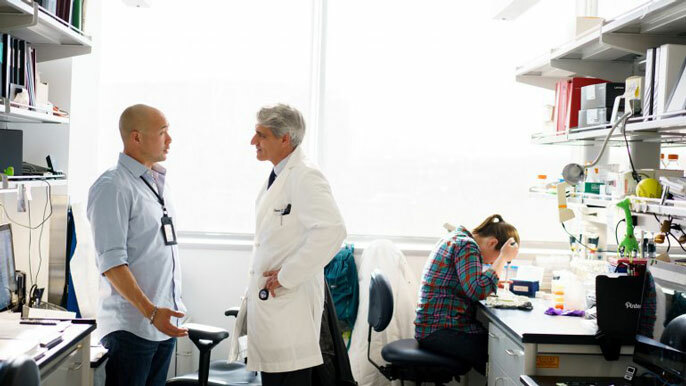 Neuroscientist Jonah Chan (left), Ph.D., chats in his lab with Stephen Hauser, M.D., director of the new UCSF Weill Institute for Neurosciences. Joan and Sanford I. "Sandy" Weill during an April 25 visit to the UCSF Mission Bay campus. From left to right: Matthew State, M.D., Ph.D., UCSF Chancellor Sam Hawgood, MBBS; Joan Weill; Sandy Weill; Stephen Hauser, M.D. ; Stanley Prusiner, M.D. Stephan Sanders (right), Ph.D., who studies childhood neuropsychiatric disorders, works with bioinformatics programmer Michael Gilson (left) and postdoc Joon-Yong An, Ph.D. By better integrating neurology, neurological surgery and psychiatry operations, UCSF leaders expect that increased collaboration will lead to quicker and more creative discoveries. The UCSF Weill Institute for Neurosciences will be headquartered in a new building at UCSF Mission Bay, at the current site of a surface parking lot on 4th Street. Planning for the new neuroscience building – to be located at the current site of a surface parking lot on 4th Street, known as Block 23A – is being led by a team comprising Dan Lowenstein, M.D., executive vice chancellor and provost, Talmadge King, M.D., dean of the School of Medicine, as well as faculty leaders Hauser, State, and Stanley Prusiner, M.D., director of UCSF’s Institute for Neurodegenerative Diseases and a 1997 Nobel laureate.